Sunday 17th June is Father’s Day and what better way to celebrate than a family lunch or dinner out at a restaurant. Many restaurants will be busier than usual this sunday, full with happy Dad’s, so make sure you ring ahead and reserve a table if possible. While not quite on the scale of the annual Mother’s Day lunch or dinner tradition, Farther’s day continues to grow and some restaurants have chosen to suspend their usual menu deals or discounts for the day. However, we enjoy and challenge and have been busy searching for the best restaurant deals which any Dad will love. Take a look at our favourites below. 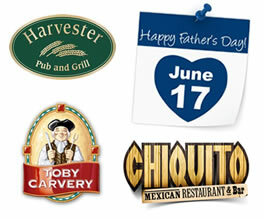 Chiquito Mexican Restaurant and Bar, Dads Eat for Free! Chiquitos are offering dads a free main meal when another adult in the party purchases a main meal from the Menu. Offer valid for parties with two or more adults dining on Fathers Day. Frankie & Benny’s Dads Eat for Free! Choose two courses from the new ‘specials menu’. The free meal can be either starter and main course or main course and dessert. This is a great offer and with more than 180 restaurants there is bound to be one near you. Ask Restuarant are offering a Pizza and a Peroni for £10 on Fathers Day only. This offer entitles each person in the party to any pizza and 330ml Peroni for £10 (Peroni can be substituted for a glass of wine or soft drink) However, this offer is not valid to anyone under 18 years. Also check out our Restaurant Vouchers page for more deals, but don’t forget to check all terms and conditions and make sure your voucher applies to Father’s Day. 0 Responses to "Best restaurant deals especially for Farther’s Day"